Every Monday of this year has been unforgettable. We're faithful viewers of Icerde since 19/9/16, when first episode came to our screens and made a big sense even to the most demanding person. Two brothers whom destiny has separated 20 years ago. Action, Criminal, Drama, Romance and a bit of comedy was the recipe of the sucessful Ay Yapim's series which is undoubtedly a legend. Melek left us and Sarp alone. She will not gonna be alive when this tragedy will come to an end, an end which gonna be appointed by her father, the worst criminal in turkish series's society. The 2 brothers have find both each others and their mother. They sent to the prison Celal and took revenge from all of their enemies. Lets take a look of the clues which we have until now about the last episode. Are u ready guys to make a prediction for the best final on turkish tv's history? 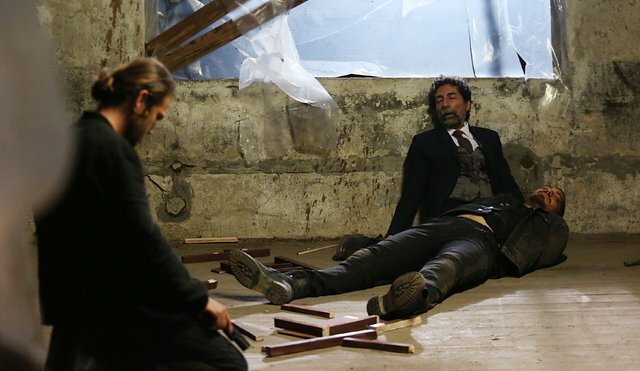 There are also some reputations which saying that Metin Yilmaz is alive and will gonna come to the surface this Monday.. And its true guys does anyone of u remember Metin's grave?No...There aren't anyone of series's characters who has made a reference to him..So how about the turn which is going to put to Icerde? Lets take a glince to sneak peek...Eylem saying to Fusun that Celal took Umut. Fusun getting crazy..First trailer showing us Eylem and Mert very very happy and then Celal who threating their happiness...Both of them have showed that Umut is in dange. But why guys? Is obvious that the senarists wouldnt want to show which of them will gonna have a tragic end. So in my opinion they're giving Umut as a victim so as to make the big plot twist. And now the third trailer. Police trying to find Celal who has made a big trap. We can understand that Umut is in danger...And Sarp screaming his brothers name..Ok all of the trailer saying us that Umut is going to die! But no! The senarists wouldn't want to show from the trailers the end of this series. They wouldn't want to make such a spoiler, they are extremely smart to do it. So Sarp the person whose the clues showing alive have more posibilities to be the dead one. So guys if u want my opinion I think that either will be a happy end in order to make the big surprise or Sarp will die as a sacrifice for his family..Because Metin Yilmaz wanted to be the one who would save their family. And thus the end will be as Metin wanted. Sarp the victim Umut and Fusun together. Extremely sad isn't it? The mother just found her lost son and now is going to lose the old one. There are other predictions which saying that Umut will die and Sarp will bring him on his birthday a birthday cake on his grave. Other predictions saying that are going to die Sarp and Fusun or Eylem and Umut going to the nuthouse.And the last one saying that the brothers will win Celal. We can't know the final yet. But I'm sure guys that we will not be disappointed. So stay tuned ONE DAY LEFT! Are u ready world????? ICERDEFINAL hashtag! This monday lets say goodbye to our legend and ofcourse lets writte it on our hearts! Thank u Icerde for made this year absolutely perfect! Αναρτήθηκε από Unknown στις 2:14 μ.μ. Bu bir aşk degil..Bu bir Kara Sevda.. Ve Mutlu Son! Happy end!